The thought of living aboard a boat sounds lovely, romantic and simple—and indeed it can be. But if you’re thinking about making a move from land to a boat, you need to consider a few things. If you don’t already own a boat, you’ll need to buy one, and even if you do have one, you may look at it in a different light and decide, “We’re gonna need a bigger boat.” Where’s the boat going to be? What will you do with all of your stuff? How much will it cost? How will it affect a relationship or family? There are as many opinions on what makes a good liveaboard boat as there are those who liveaboard, so start by asking yourself some questions. All boats are compromises. If it has lots of space, it isn’t likely to handle like a sleek racer. If a big galley is important to you, you may have to give up space in the saloon or the head. Will you need heating or air-conditioning? Every boat comes with its own set of issues, and finding them can be difficult. You don’t want to find out there’s a leak in the deck right over your bunk the first time a storm hits at 0300. Take your time, look at a lot of boats and find out what’s important to you. A good yacht broker can be a big help in this process. Where to put the boat is another big decision. Will it be in a marina, on the hook or on a mooring? All three options have their rewards and also their drawbacks. 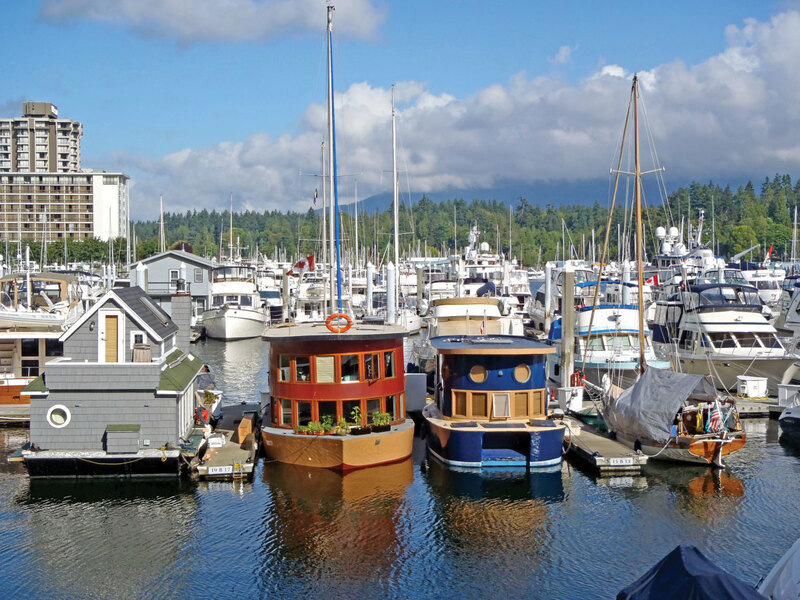 Marinas are a great choice, but the facilities and the rules for living aboard vary, so be sure to go down and meet with the marina manager. Ask for a tour of the marina and the facilities. Are the showers clean? Are there showers at all? Is there a laundry room? If you choose to live aboard in a marina many things are made easy. Marinas offer you a place to park your car and get your mail. There is normally a good social life, complete with dock parties and plenty of camaraderie. (Heck, you can even get pizza deliveries.) If Wi-Fi is important to you, go online near your prospective slip and check it out. 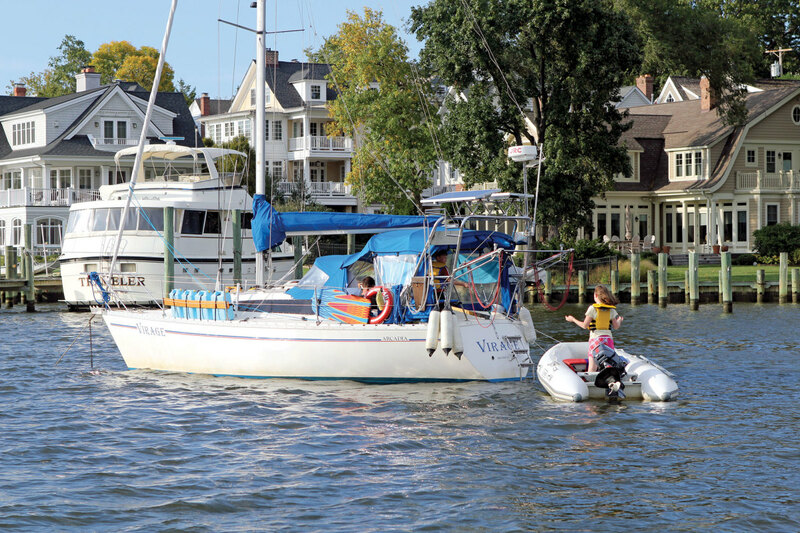 Marina Wi-Fi is notoriously slow, and some marinas have gaps in the coverage. Living aboard on a mooring or at anchor is the ultimate getaway from the rat race. Even if you’re only a short distance offshore you feel unplugged from the world. There’s nothing like sitting in the cockpit watching the sun drop below the horizon as the waves gently lap against your hull. It is also the low-cost option, since moorings are economical, and you can anchor for free just about anywhere. That said, living on the hook also means living off the grid, so that many of the things most people take for granted you will need to provide for yourself. On most boats power for lighting and other functions comes from solar panels, wind generators or a diesel or gas generator; having all three isn’t a bad idea. You’ll also need a source of water for drinking and bathing. 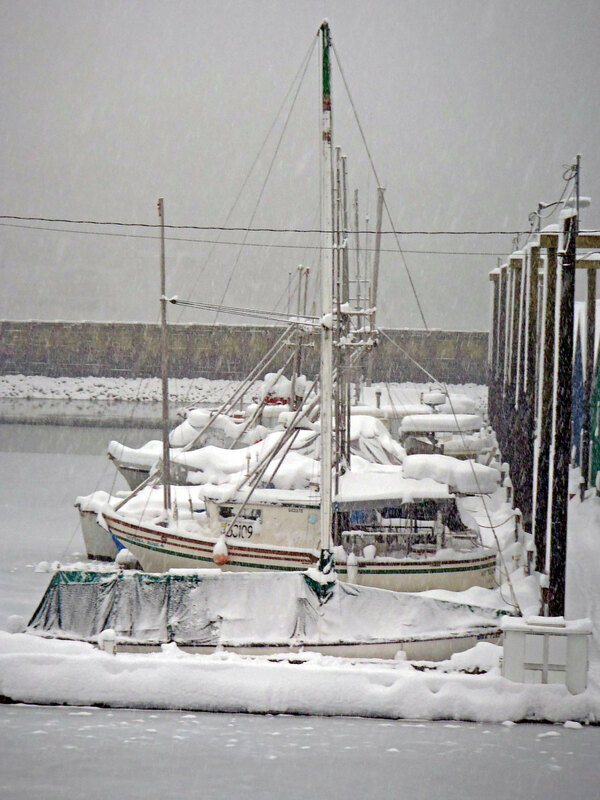 If you live in saltwater, a watermaker may be an option. But most watermakers have limited capacity and require regular maintenance, which is why many liveaboards haul water to their boats in jerry cans. When living on a mooring, even something as simple as taking out the trash or getting mail takes some thought. Mailbox rentals work for many people, but if not there are great mail forwarding services that give you an address, scan your mail and allow you to view it online. Lastly, you need a way to get to shore. A dinghy with an outboard will be essential. Still, while there are many hurdles to overcome, the satisfaction of living off the grid on your own vessel is worth it for many people. And what about relationships? Moving aboard with your significant other make for plenty of romance. Just about everything takes planning and cooperation, so there’s more togetherness. The downside, though, is that all this togetherness also takes lots of cooperation. A boat (even a big boat) has limited space, and often there’s nowhere to go to get away. It’s not uncommon for relationships to become strained as a result of being at close quarters all the time. [advertisement]Moving aboard with children opens a whole new can of worms, because of challenges such as schools, friends and safety issues. However, there are also plenty of rewards. Kids are great ambassadors and open many doors to friendships and adventures that would otherwise be missed. Also, most kids who grow up living aboard seem more mature, more in tune with nature and happier living in their own skin than the average kid ashore. Once you’ve decided to make the move you’ll be faced with a dilemma. What are you going to do with all that stuff? Face it, in a house or apartment we tend to accumulate stuff. Start by separating what you need from what you want. Be ruthless and ready to make hard choices. At some point you’re going to be tempted to run out and rent a storage unit. Think twice, though, before you do so. If you just sticking a toe in the water and can’t bear to part with your stuff, set a time limit and revisit the issue later. We put our stuff in a storage unit when we moved aboard and several years later realized that we could have purchased all new stuff for what we had paid for storage—an expensive lesson. More people are working from home, and when your home is a boat, living aboard gives you the opportunity to expand your horizons. Living on a boat means you can pick up and move much more easily than if you were land-based. Of course, it’s hard to leave friends and family, but it’s fun and rewarding to make new friends and explore new places. The world is your oyster. Ever wanted to live in another country and experience new cultures and people? Living aboard might be your ticket. If you are leaving your country of residence make sure your bank accounts and credit cards are all in order. It is very difficult to open new accounts without a physical address. We’ve lived aboard Mermaid, our 51ft double-headsail sloop, for 13 years. We’ve lived in marinas, on moorings and at anchor. We started with kids on board and also had a pet. We’ve spent years living in the same place, but also gone through periods where we moved every few months. We’ve lived aboard in the United States, Mexico and Central and South America. Most of the time we’ve had jobs, but we’ve also taken off and set sail for distant shores. Living aboard isn’t for everybody. Some people need the picket fence and the recliner, and there’s nothing wrong with that. If you’re not afraid to color outside the lines, though, go for it. There is no right or wrong way to make the move. Find out what is right for you and realize that you will have to make some compromises. For example, I like my sundowner glass of wine in the cockpit served in a Waterford crystal glass, but my husband prefers his in a mayonnaise jar. (We made room for both.) Bottom line: we are quite happy with our life aboard our boat.